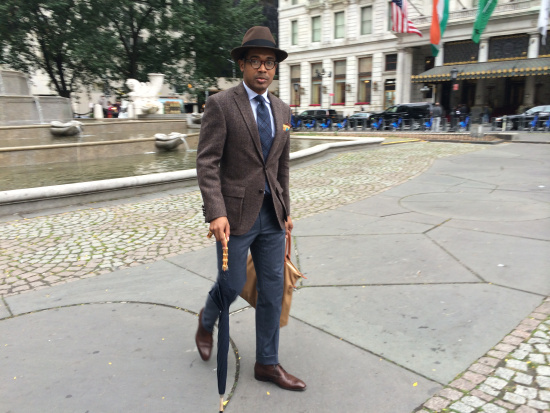 With cool weather making its official return, the opportunities for men who enjoy dressing are limitless. Layers upon layers of textures and richer hues than ones afforded to us during summer months are now a necessary armor against the elements. As a backdrop to the plums and eggplants, rusts and burnt oranges that no doubt line the closet of the well dressed, deep browns and greyish blues provide a quiet balance. As we wade slowly into the not yet frozen pool of autumnal shades, I'm reminded how often nature unwittingly dictates our selections. The previously mentioned neutrals of brown and blue and grey play off the sky and its less sunny tendencies during the next several months. Additionally, browns, deep reds, and oranges are reminiscent of the bare trees and their newly fallen leaves, which will hopefully be raked by children more enthusiastic than I was. These shades, specifically, play well off of each other with many shades of fall. Together, though muted, there lies a quiet elegance in the slightly less formal appeal of it.